The Pinacate and Gran Desierto de Altar Biosphere Preserve was created in July 1993 by decree of the Mexican government. Conscious that we protect what we know, the authors of this book describe the geology, plants, animals, and human history of this special place. Travelers passing through the area and visitors to the reserve will be able to use this book to observe, get acquainted with, and understand the land's natural and historical happenings from prehistoric past to present. In this book the features of this hard but striking land are generously illustrated with dozens of large landscape photographs, dozens more images of creatures and plants, as well as maps. Larry G. Marshall, Ph.d., is a retired geologist, paleontologist, and naturalist who has has authored numerous scientific and popular article on Earth history and has developed exhibits on historical, cultural, and natural-history topics. He has led numerous eco-tours in the Southwest borderlands. Clark Blake, Ph.d., is a retired geologist with USGS, and recently with Western Washington University. An expert birder, he is also editor of Tucson Audubon Society?s How to Find Birds in Southern Arizona. 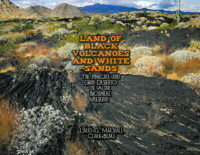 Review by Richard C. Brusca, Ph.D.
With Land of Black Volcanoes and White Sands, Drs. Marshall and Blake have created a unique and beautiful book?both intellectually satisfying and visually stunning....Given its size and importance, there has been surprisingly little research accomplished in the Pinacates. However, what has been done is succinctly summarized in this book — by two scientists who know how to write for a broad audience. For naturalists, credentialed or casual, the book provides well-organized and easily read summaries of major aspects of the region?s natural history — geology, biology, human history, etc. For lovers of the Southwest's most special landscapes, it provides an exceptional portfolio of beautiful and illuminating photographs. In fact, there is no other single place where one can find the El Pinacate captured visually in such a broad and stunning fashion?.How I wish I had had this book so many years ago, when I first started exploring the magnificent and mysterious coastal region between the border and Puerto Peñasco. As the authors state, "The Pinacate, for many, is the heart and soul of the Sonoran Desert." If you want to explore the natural history of this "heart and soul," this is the book to start with. Virtually every aspect of the region's natural history is covered, from pupfish to playas, from sand food to sand dunes, from astronauts to ejidos?.Naturalists familiar with La Frontera know that El Pinacate is the stuff of legends. From the O?odham salt treks to the coast; to the famous and colorful explorations by Hornaday and Sykes, Ives, Lumholtz, and Julian Hayden; to the Apollo astronaut training sessions — the Pinacate has been a place that draws both by its harshness and its promise and hidden mysteries. The book [also] provides important and useful access information (including new maps) to the Pinacate Reserve.? [Land of Black Volcanoes and White Sands is] a book that every Southwest naturalist should own?and keep within quick reach!